The major expansion of my Prussian Napoleonic army has added nearly 200 Infantry and 40 cavalry. That much of an increase naturally needs a corresponding increase in the Prussian Artillery arm. This post concerns the new Foot Artillery batteries - four in all. First up are three new six pounder Foot Batteries. Old Glory figures with Sash and Saber guns. The only thing I haven't done yet is to apply the Magic Wash to the guns, which will tone down the blue of the carriages a bit (paint color is Delta CC "Bluejay"). I added some "Large"Silflor tufts to the bases, which looks OK, but I think these "Summer" tufts may be a bit too green, so I am considering dry bushing them with a grey-green color to tone them down somewhat to a shade more in keeping with the early Autumn flocking theme. When Foot Artillery officers wore the "schirmutze" cap, it was grey with a black band, piped in red. One of the Batteries is from each of the three "brigades" that the artillery were assigned to administratively, with the shoulder strap colors varying accordingly - Preussisches (white), Brandenburgisches (scarlet), and Schleische (yellow). Also joining the Army of der Koenig is a new 12 pounder foot battery as well. By my usual convention, 12 pounder batteries get 4 crew figures per base, as opposed to the three figures per base of lighter batteries. This makes them easier to pick out on the wargames table. Foot Artillerymen wore dark blue coats with the collars and cuffs in black, trimmed with red. The turnbacks were red. Shoulder straps as previously cited - this unit has yellow straps, placing them in the Silesian Artillery Brigade. In 1815, all batteries changed to red shoulder straps. Boring! All; leather work was black for the Foot Artillery. The somewhat old fashioned looking Bicorn was an option for Artillery officers as well, and we can see this battery's commander has opted for same. The Prussian Artillery arm underwent an enormous expansion in 1813. Some of the new batteries were designated as "Landwehr" batteries,. but even the nominal "regular" batteries suffered from dilution of trained personnel, so their performance sometimes left something to be desired during the earlier parts of the 1813 campaign. Like their infantry and cavalry counterparts, though, field experience (and the break in fighting for the Armistice) resulted in steady improvement over the course of the Befreiungskrieg, and certainly by Leipzig the Prussian generals had few complaints about their artillery support. The set has 5 large and 5 medium barrels - they were dark brown plastic, so after gluing the halves together. I just dry brushed then with a light tan color., painted the hoops black, and applied a generous coat of "magic wash" all over. This Silesian infantry men seems to making a beeline for the barrels, doubtless hoping at least one of them is full of some good beer! Well, actually, a lot of beer, if still full - 117+ liters per barrel! For comparison a full size keg of beer is only 50 liters! The motivation for painting them now is to use some of them as props on the bases of the windmills I'm building, which are nearing completion. The music was written by the Czech musician Jaromir Vejvoda 1927, and later arranged by Eduard Ingris. The English Lyrics were written 1939. It became popular with soldiers of many nations during World War 2, with varied lyrics (and titles) existing in many languages. The Andrews sisters recorded a version in 1939, and it was a staple (played with amazing dramatic flair and energy) of Liberace. Elton John was even said to play it in his pub. Perhaps the best known version in the US is this recording by Bobby Vinton, a.k.a. "The Polish Prince", from 1975. It is also an unofficial theme song of my sister's alma mater, The University of Wisconsin, and almost a mandatory song at a Polish-American wedding reception. Finally, it became a standard item in the repertoire of our drinking songs when I was playing in the Band in college. I don't think it is possible to listen to this song without smiling... and I don't even particularly care for beer myself. The only problem is that after listening to several versions last night, I have the darned thing stuck in my head! The Lützow Free Corps (Lützowsches Freikorps) was raised in February 1813, and was officially titled the Königlich Preußisches Freikorps von Lützow The C.O.was Ludwig Adolf Wilhelm Freiherr von Lützow, who had served under Major von Schill during his ultimately successful raid in 1809. The Freikorps eventually consisted of three, four-company, battalions; five squadrons of cavalry and two batteries one horse and the other light foot. Eleven of the infantry companies were Musketeer; the other, which was part of the 2nd Battalion, being "Tyrolean Jager". This unusual unit was raised by Lieutenants Riedel and Ennemoser, the latter having fought with Andreas Hofer in 1809. Their men were drawn from the Tirol and were dressed in the style of the Austrian Jagers. Of the cavalry, three squadrons were Hussars, 1st, 4th and 5th; the 2nd was mounted Jager and the 3rd were Uhlans. In June 1813, the 1st Squadron were converted to Uhlans. In the reorganization of March 1815, the Musketeer Battalions formed the new No. 25 Erstes Rheinisches Infanterie Regiment; three squadrons joined the 6th Uhlan Regiment and one squadron went to the 9th Hussars; the mounted Jager squadron was disbanded. The Musketeers were dressed in a black Litewka, the collar, Polish cuffs and shoulder straps of which were piped in red; the buttons were brass. They had black trousers with narrow red stripes down the outside seams; they were generally worn over short black spats. The head-dress was a Fusilier shako to which could be affixed black cords and a horse-hair plume. Usually a waxed cover was worn with the shako. The Tyroler Jager-Kompagnie were dressed in grey jackets with green Polish cuffs, collars, shoulder straps, lapels and turnbacks. Their trousers were also grey and had a wide green stripe running down the outside seams. 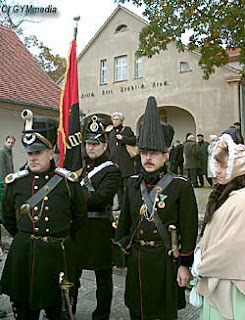 Their head-dress was made of black felt and was modeled on the Austrian Jager pattern "Corsehut". To it was fitted a green plume, officers having a green and white feather Busch. The leather belts were blackened and a brace of pistols was carried in the waistbelt. The Freikorps was raised and promoted as as a "Pan-German" unit, not a specifically Prussian one, and included volunteers and deserters from the other many German states. As such, the unit enlisted a number of students and intellectuals (and at least 2 women, serving in disguise). The most prominent of these was the young Prussian poet and dramatist Theodor Koerner. Koerner wrote a number of romantic poems and songs about the Lützowers, and the cause of the Befreiungskreig. He was killed during a raid on a French supply train at the age of 21, but his father published a collection of his works from this time, which became very popular. The Lützowers have also been featured in (German) film far more than we non-Germans might expect, occupying a major niche in the pantheon of German nationalism, even though they had the highest desertion rate of any unit in the army - 40%! The dramatic black uniforms - even the facings are black, piped in red), have made them a favorite tabletop unit for wargamers. It has even been suggested that the colors of the uniform - Black - Red-Gold (brass buttons) inspired the national flag of the German Republic! They evidently retained some or all of these uniforms during the Hundred Days in 1815. The flag chosen here (for 1815) is again purely decorative and unlikely - I chose it from among the pre 1807 Prussian standards. I used Delta Ceramcoat "Charcoal" for their black Litwekas (a very dark grey color, almost black), with highlights in CC Hippo Grey, and shading with "pure" black; I used CC Paynes Grey for the pants for some contrast - a very dark, slightly bluish grey color. With the red stripe down the seams, they look more than a bit like modern track pants! From a painting of the Korps (and Koerner), it seems that perhaps the "wings" of the musicians might have been black with white lace instead of red. Since these Old Glory figures ("Militiamen") have clogs and tattered pants, I did without the black spats, etc! Overall, the Freikorp's raiding activities were an annoyance to the French, but not of any great military consequence. During the Armistice of 1813, the Korps marched to join the main Allied army under the safe passage terms of the agreement. They were intercepted by French cavalry. The Lutzowers nationalism and guerrilla tactics had made them particularly hated by the French in general, and Napoleon in particular, and were told the terms of the Armistice did not apply to "brigands" like themselves. The infantry was largely wiped out, although most of the Cavalry escaped. The Korps was re-raised during the winter of 1813-14, and fought with the main army thereafter. As a testament to their role in German history, there is a German Lutzow re-enactor group, a Lutzow facebook page, and many more German language sites dedicated to them. 1. Was glänzt dort im Walde im Sonnenschein? 1. What glistens there in the forest sunshine? And fill the soul with terror. That is Lützow’s wild daredevil hunt. The scoundrel thought himself hidden. And springs onto the enemy’s riverbank. Why do the swords strike one another? And smolders in bloody flames. For the fatherland is indeed saved! That was Lützow’s wild daredevil hunt. D’rum, die ihr uns liebt, nicht geweint und geklagt! Upon hangmen’s blood and tyrants! Even if we only won this by dying! This is the tale of my own Quest to construct some central European windmills, for use in my Ligny games at Historicon next month, and beyond. I got the first materials (and inspiration) for this project back the beginning of April, as I detailed in a post then - 1/4" thick foamboard, 7/8" round wood dowel. I already had a bunch of Craft sticks (Popsicle sticks) which I planned to use to make the "boards" of the windmill. Some googling turned up a great site about windmills and their preservation from Estonia. This type of mill is a Post mill, and was common well into the 20th century. The earlier blog post I cited in April was also a major inspiration and partial guide. I laid out the plans for the main building of the windmill on stiff card. I decided on the main frame being 120 x 60mm. This proved to be rather large, so a second was constructed only 90 x 60mm. I cut the card out to make templates for the windmill construction. Those parts were then traced out onto the foam board, and cut out with an Xacto knife. but forgot that it would skew the eaves of the roof unacceptably. and re- did it with the pieces all squared off symmetrically, and at the same time did the second, shorter version as well. A standard home drill was used to make a 3/8" hole for the windshaft - I use the drill to also partially drill through the opposite side panel to make a place for the 3/8" dowel to seat as well. At this point, it became clear I needed some additional pieces, so back to Michael's (with 40% off coupon - they have amazing online coupons all the time) and the local hardware store for some 3/8" Fender washers, 3/8" hardwood dowel, and some assorted Balsa pieces. Windmill buildings, with test positioning of the 3/8" dowel and washer. The 7/8' dowel was sawed off (rather crudely using a saber saw and vice) at 60mm, sanded, and mounted in the center of the base board with epoxy. This will form the "post" of the that the postmill will sit upon. The Craft sticks were cut into 60 and 30mm lengths and glued on "bricklay" pattern, plus some custom cut pieces for the eaves. I used wire cutting pliers to to this cutting, which worked very well. Door is thin balsa wood, and the door frame and window frames were added with more craft stick wood. View showing the windshafts added. Dilute white (PVA) glue was brushed all over the project after it had dried for added strength. The supports for the post were added to the bases using the 1/2" balsa (cut with saber saw), and glued on with epoxy. I did this with 45 degree cuts. Here I made an error by not ensuring the foot print of the supports would be inside the footprint of the shed's base. Oh well, too late now! The sheds were epoxied to the post and supports. While at Wally-Mart I picked up two more items. I had been pondering how to make the arms and vanes of the windmill itself. Above are two packs of assorted square hardwood dowels (about $1 each), and the tough nylon lattice used for rug hooking projects. The sheds, posts, and supports were dry brushed with first a yellow brown craft paint, then CC Cadet Grey. The base will be finished last. and 90 mm for the shorter one. The vanes were cut out of the nylon rug hooking lattice, spray painted black, and attached to the arms with epoxy. The lattice of the vanes was then dry brushed with Cadet Grey ( a very flat light grey with no blue tone at all). I painted the arms (and washers) of the windmill a light red brown for contrast to the shed. I am going to leave the arms of the windmill unglued to the wind shaft to allow easier transport. They are pretty sturdy, and when they are inevitably struck by the "Hands of God" during play, I'd rather have the arms knocked off the shed (and easily put back on) than knock over the hole structure! At this point, they are still a bit of a WIP (windmill in process). I need to add a small porch and ladder on the door side of the mill using balsa wood, and then terrain and finish the bases. That shouldn't take more than a day when I have a chance, and then I'll post some more pictures of the completed project! A little Gordon Lightfoot - perhaps my favorite of his songs!